I aim to stay dry on most of my hikes but sometimes there is the occasional neck-deep river fording in Costa Rica’s Corcovado National Park or getting caught in a heavy downpour in Olympic National Park’s Hoh Rainforest. In such situations, I have ended up using a plastic tarp/bag to protect my backpack and have always wished for a rugged waterproof backpack that would be more effective against the power of water. To my delight, my wish was granted when Outdoor Products sent me their Amphibian Weather Defense Backpack to try it out. I love the Outdoor Products brand and have several of their products which I adore, including their backpacks and outdoor accessories for hiking and backpacking. 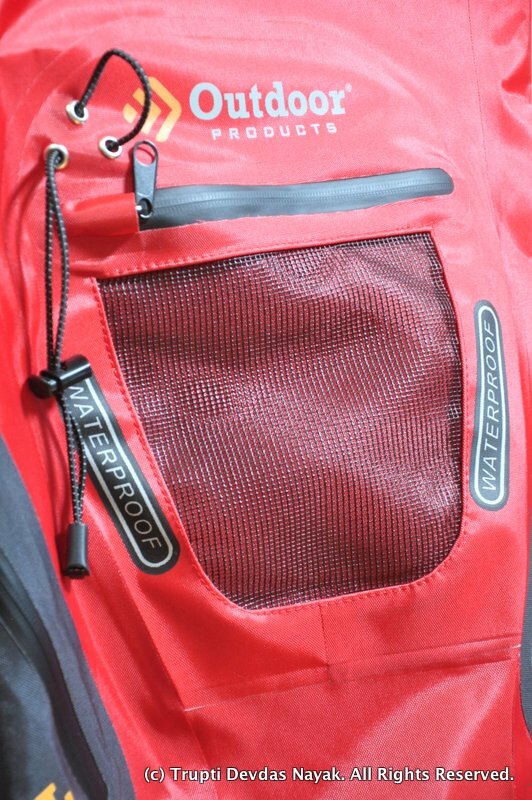 I’ve been using their Amphibian Weather Defense backpack for several weeks now and I must say, I’m very impressed with the top-notch quality and effective waterproofness of this product. The backpack is made from 420 Denier fabric (densely weaved) with thermoplastic polyurethane coating (TPU) which is resistant to oil, grease and abrasion. 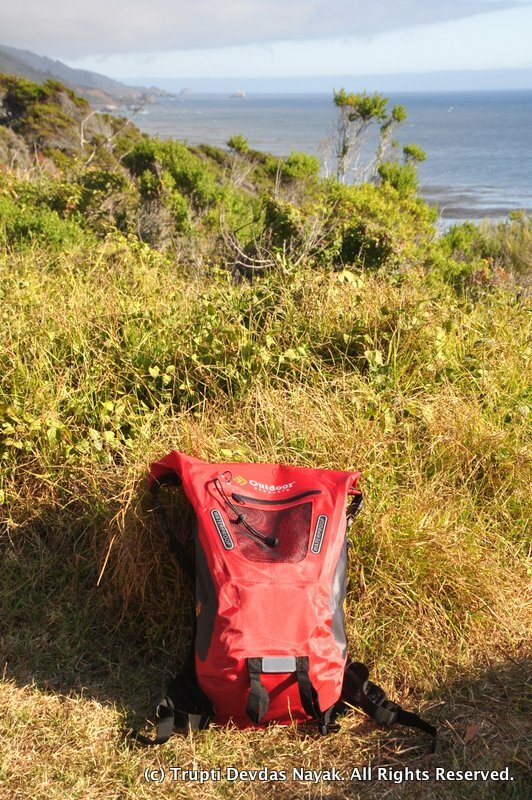 The backpack is a comfortable size capable of holding approx 20 liters, which is great for both weekend or day trips. I was initially not sure of the roll-top seal, but after using it for a while, I’ve realized that this is the most effective way of keeping water out during a heavy downpour or when fording a river. The welded seams all over the bag and the roll-top seal ensures the bag is completely watertight and all your belongings remain dry and safe. 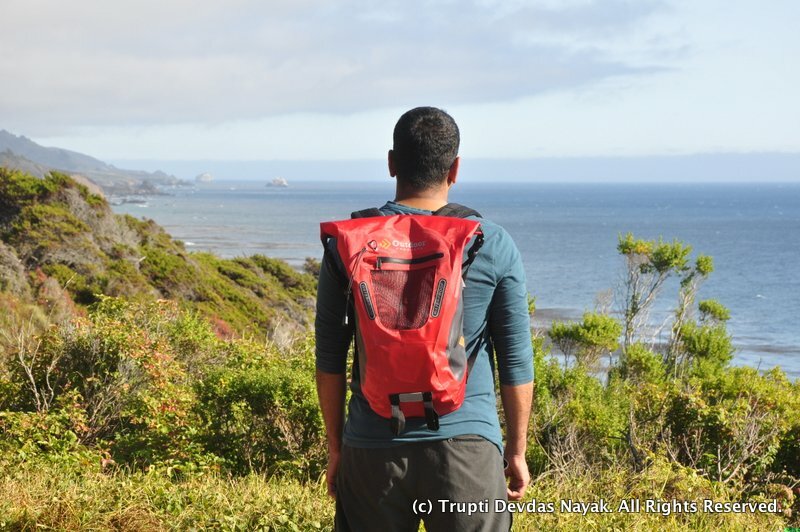 On a recent camping trip in California’s Big Sur wilderness, I loaded up Outdoor Products Amphibian Weather Defense backpack with everything that I needed for the weekend and hauled it onto my shoulders. 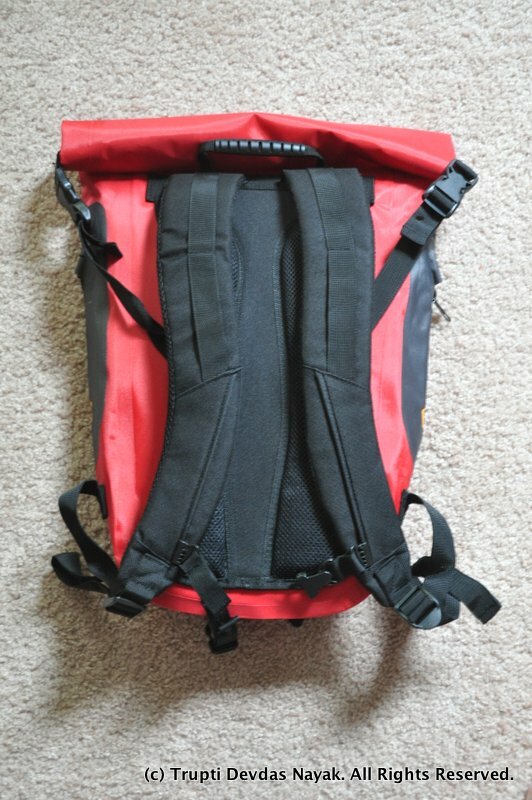 Thanks to its comfortable padded shoulder straps and sternum handle, the backpack did not feel heavy at all! There’s even a handle on top of the backpack which allowed me to carry it around easily when I wasn’t wearing it. 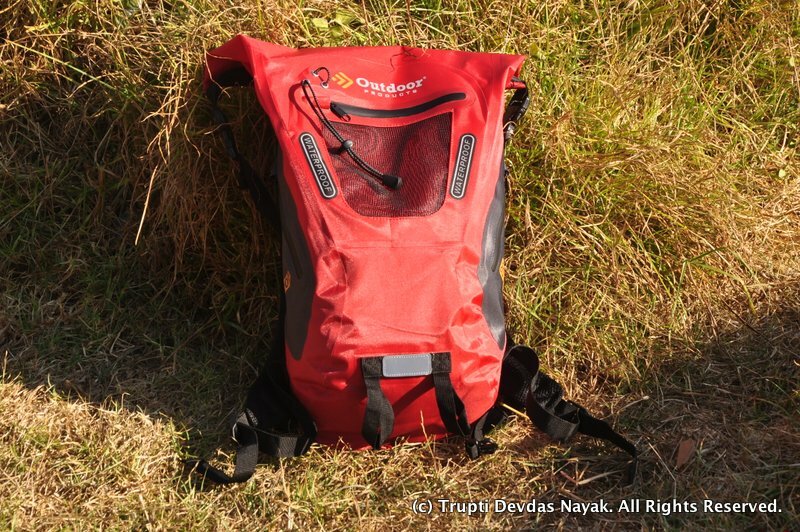 I love that the backpack has a front mesh pocket with a zipper and two side pockets that allowed me to easily access essentials (like energy bars, chewing gum, headlamp etc) on the trail without having to open up the roll-top main compartment. I always carry my hiking poles on strenuous trails and Outdoor Products Amphibian Weather Defense Backpack makes it easy to stow the poles away when I don’t need them. Hiking at night is made easier and safer with reflective accents that make the backpack and you visible from a distance. Although I haven’t hiked at night yet with this backpack, it makes me feel better with the knowledge that the backpack already has its own reflective accents. The Outdoor Products Amphibian Weather Defense backpack comes in many colors, I love the one I got which is a bright eye-catching red, there’s also a cheerful blue color available online. With all these amazing features rolled into one backpack, it’s no wonder that Outdoor Products Amphibian Weather Defense Backpack has been consistently voted the #1 Waterproofing Backpack by Backpacker Magazine! I look forward to using this backpack on many more exciting hikes in the future. Perhaps hiking the Virgin river through the Narrows in Zion National Park is where I should be headed next? Buy your own Amphibian Weather Defense Backpack here for $59.99. 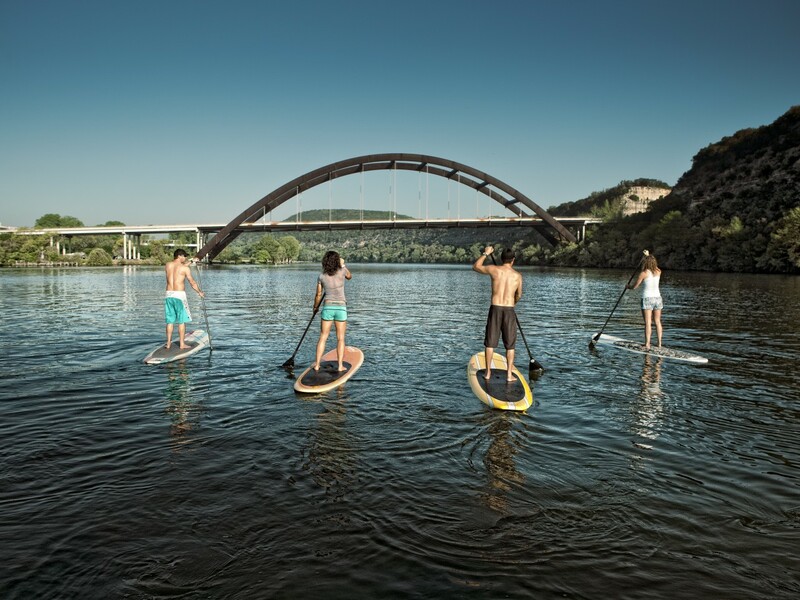 For all other Outdoor Products, go here. Disclosure: Outdoor Products provided for my Amphibian Weather Defense Backpack in exchange for writing about my experience. Regardless, everything I have said in this post reflects my honest observations and opinions. 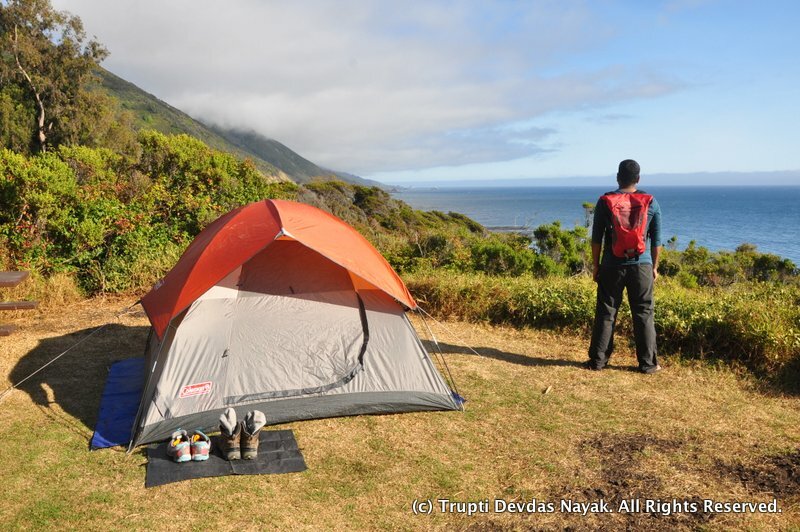 This entry was posted in Backpacks, Gear Reviews, Homepage Featured by Trupti Devdas Nayak. Bookmark the permalink.